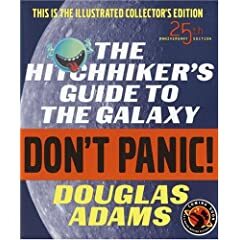 Loin du niveau du guide du routard de la galaxie, ce « nouveau » délire nous fait suivre Dirk Gently, détective très spécial, dans une aventure où les forces en présence sont un aigle, une infirmière, des dieux, le milieu du disque et de la publicité. And then, one Thursday, nearly two thousands years after one man had been nailed to a tree for saying how great it would be to be nice to people for a change, a girl sitting on her own in a small café in Rickmansworth suddenly realised what it was that had been going wrong all this time, and she finally knew how the world could be made a good and happy place. This time it was right, it would work, and no one would have to get nailed to anything. Sadly, however, before she could get to a phone to telle anyone about it, a terrible, stupid catastrophe occured, and the idea was lost for ever.